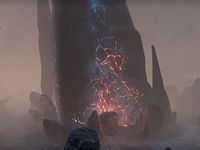 Whatever this colossal onyx shard may be, one thing is certain: it comes from somewhere beyond the bounds of Tamriel. And the fabric of Tamriel may not be strong enough to contain its power. Spellscar is a giant obelisk that crashed to Tamriel, located north of Belkarth. The resulting impact created a large crater and devastated the surrounding landscape. Groups of Spellfiends and atronachs guard the area. Spellscar Objective: Stabilize the Mage's staff before it explodes. 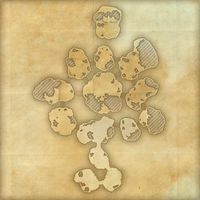 Prior to Update 12, this location used a Ruins map marker.